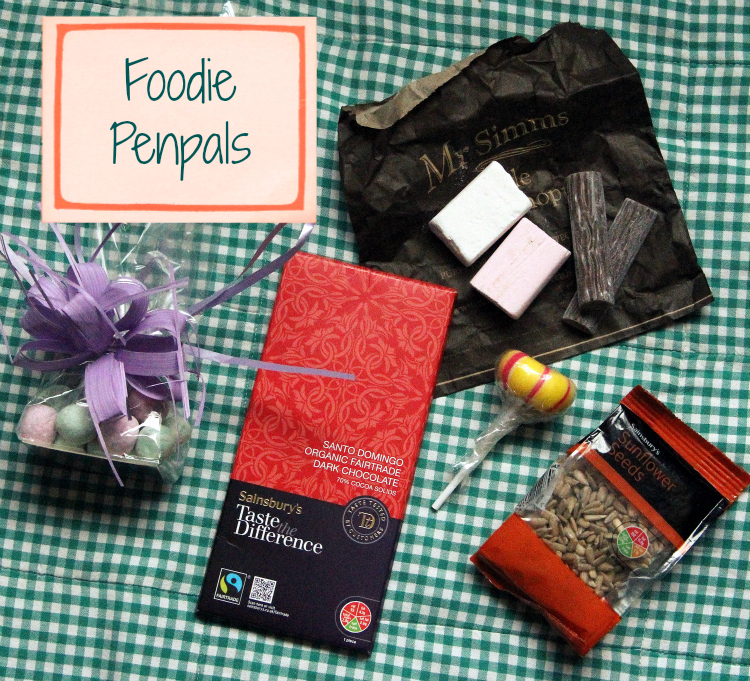 Last month was my first time being a Foodie Pen Pals swapper. I found out about it while reading Thrift Street and it was immediately clear to me that I needed to sign up. Basically, the swap involves packing a delicious care package for somebody and receiving one from somebody else in return. Yes, please! The swap is organized by Carol Anne from Rock Salt, and you can find out more about it here or by clicking the link in my sidebar. The whole idea originated in North America, and I am glad I found out about the European version! So here is what I got from my partner Maya. I pretty much gave her free hand with her choices and her parcel turned out to be a very sweet one. No complaints here! She packed some lovely dark chocolate, which I am saving for a rainy day. I got a lollipop and some pick-and-mix candy. The pastel coloured sweets are melon- and berry-flavoured and are not going to last very long. I also really like sunflower seeds, I have had a bit of a thing for them lately. I like them in salads, over muesli or just as a snack. Thank you, Maya! I sent a parcel to Switzerland myself, and cannot wait to see who I'll be paired up with for April. It's a lot of fun to go food shopping for another enthusiast and to open a mystery package full of goodies once a month! wow, Ive never heard of this before! What a fun idea, I love getting sweet treats. Thanks for sharing. Love the parcel you sent to Switzerland, as well as looking delicious, it was so pretty.